I’m in completely the wrong job. I write about spa treatments and beauty products for a living and yet I have to limit my tried-and-testeds to things which involve very few products, or only products I trust – because I have sensitive skin. That might sound like a very normal thing to have but trust me, it’s a nightmare. I have to stick to brands that I know and have used for years, not because they’re the best but because I won’t turn red when I use them. I’ve had some nasty allergic reactions to products before and it’s made me very cautious – E45 cream and Dove shampoo are now my luxuries. Even water can be my skin’s worst enemy, as London is one of the worst places in the UK for hard water. That’s why when I do find something new that I can actually use without wearing a bag over my head for the following week, I get quite excited. The lovely ladies over at Pegasus sent me over two products to try from the Avène Eau Thermale range – the Soothing Hydrating Serum and the Hydrance Optimale Rich Hydrating Cream with SPF 20. And I can tell I’m about to be hooked on them. One look at the packaging was all it needed for me to be interested – when you’ve got sensitive skin you know not to look for glitzy covers or illustrations. Simple, clinical almost and covered in information about the product, they looked like something I could try. I had a little read about the brand – the products use Avène Thermal Spring Water to soothe and hydrate skin, based on the well known principles of hydrotherapy. So – the products. Firstly, the serum; you use it morning and night after cleansing. Having previously used the No7 Protect and Perfect wonder-serum, I found that this was similar but had a better texture. It glides on to leave skin silky smooth and has a very delicate fragrance which reminds me of a mixture of Johnson’s Baby talc and the smell of my mum’s hand cream – no idea what she uses but it’s gentle and fresh. Personally I hate strong fragrances in my skincare (usually an indicator that it can cause irritation) so I absolutely loved this. I would definitely choose this over No7 as it sinks in easier – I often found with Protect and Perfect that it left a weird residue afterwards. Secondly, the hydrating cream; I am terrible for remembering to put on SPF as part of my usual routine, like most people. Come summer we all throw it on and our skin is happier than ever, but then the sun goes away and we forget all about it; but one thing I have learned is that SPF is a great anti-ageing device as well as necessary in the winter for when the wind is freezing cold. So, a moisturiser with SPF included is the best way to go for me – and this one is my favourite so far. With the same gentle fragrance as the serum, this moisturiser is not too thick (which I hate) and left my skin feeling super soft – I kept trying it on my hand at first and then adding more because my hands looked magically smoother within seconds. I had the ‘Rich’ version but they also offer a Light version too – probably a good way to switch up your winter and summer beauty regime. What’s great about the brand is that they’re not too expensive (around £10 or so), and of course, for me, that they glide on and soothe my skin without causing any allergies. If you’re like me and scared to try new beauty products out, don’t be scared of Avène – the fact that the products are based on water as a main ingredient is a good start in itself. 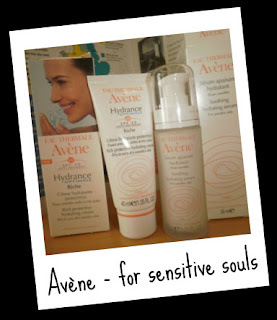 Disclosure: I was sent the Avene products to try by their PR. Thank you! This entry was posted in avene, beauty, hydrotherapy, lifestyle, sensitive skin. Bookmark the permalink. ← Chewing Gum to the Rescue? 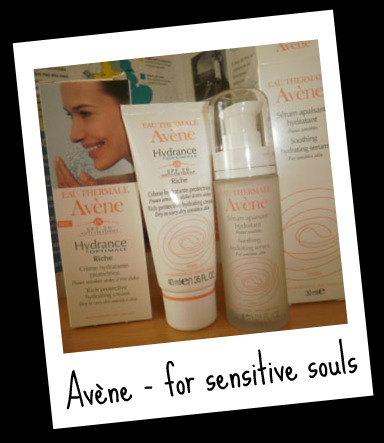 Also, check out Alison’s blog on Wahanda for a mention of Avene – their centre is a haven for eczema sufferers, so ditch the itch for National Eczema Week!